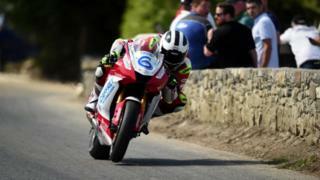 County Antrim road racer William Dunlop had a “smooth style on the track and gracious and thoughtful manner off it”, mourners at his funeral have heard. 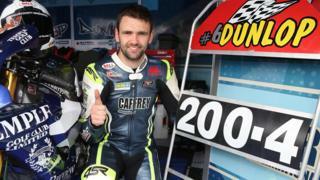 The popular 32-year-old rider died after a crash at a race meeting in the Republic of Ireland on Saturday. 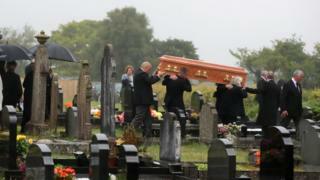 Thousands of people gathered for the funeral at Garryduff Presbyterian Church near his hometown of Ballymoney. His death came after his father Robert died in a crash in 2008 and uncle Joey Dunlop was killed at a race in 2000. Family, friends and road racing fans were among those at the service on Wednesday. 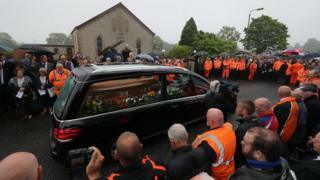 “Since [Robert] began the road racing scene at 17 he has been consistently competitive and an example of a great sportsman,” the minister told mourners. “Ten years ago at Robert’s funeral I said: ‘Not many people finish what they start; not all persevere in adversity or push themselves to their potential – this made Robert stand out from the crowd’. “William watched and learned from Robert and his life developed those same qualities. The situation improved and the couple were looking forward to the birth of their second child.